About LightGrid, LLC – LightGrid LLC. Starting from a small team in 2010 to a small business today, LightGrid has worked to provide information technology service management throughout our journey as a ISO 9001:2015 registered firm and HUBZone certified small business. With innovation at our core, LightGrid strives to be a leader of strategy and technology in the ITSM arena. With years of experience and expertise in IT support, LightGrid is capable of providing strategic solutions for span program development, engineering acquisition, consultation, research development, testing, and evaluation. 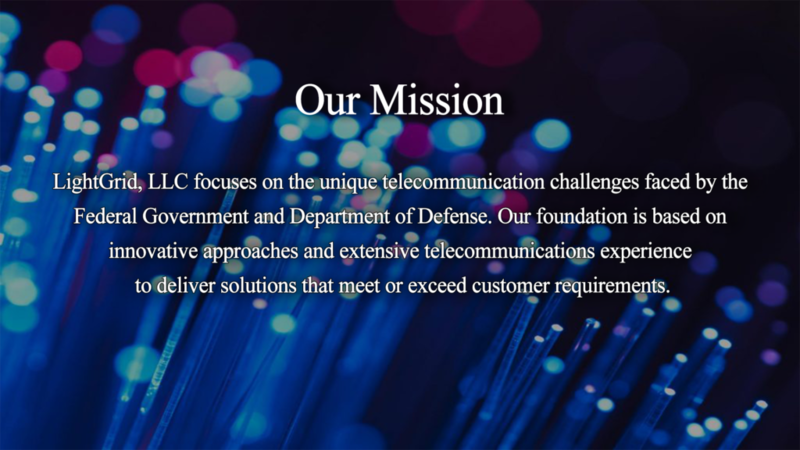 By the experience gain by being the lead author of DISN Overarching Technical Strategy and the lead technical author for DISN Technical Evolution Plan, we have the ability to respond to unique telecommunications challenges faced by the Federal Government and the Department of Defense. We maintain customer satisfaction by working towards a strategic plan with our clients and providing valuable insights concerning trends in network innovation, tools, or services. Here at LightGrid, our core capabilities are what drives customer satisfaction as we provide support to Technology Planning, Engineering Analysis, Implementation Solutions, Service Management, Project Management.